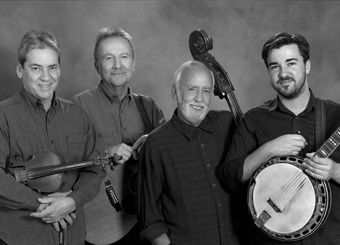 The masterful musicians in Loafer’s Glory take their bluegrass nice and easy. They love the music, they find joy in playing it, and the result is glorious indeed. Berkeley-born Herb Pedersen plays guitar and banjo, sings, and writes an occasional song. He’s been part of such bands as the Foggy Mountain Boys, the Dillards, the Desert Rose Band, and the Laurel Canyon Ramblers, and has worked with an all-star cast of musicians, including David Grisman, Gram Parsons, Linda Ronstadt, and Kris Kristofferson. Bill Bryson plays upright bass and old time banjo and is an amazing singer and songwriter who’s been known to crack a joke now and then. Tom Sauber is an accomplished fiddle and five-string banjo player who has worked with folks like Alice Gerrard, Mike Seeger, and Dirk Powell. Patrick Sauber, Tom’s son, sings and plays banjo, mandolin, and guitar, and has worked with Laurie Lewis and the Bladerunners. The band formed in Southern California in 2010 and has released an excellent self-titled debut album that the Slipcue Guide to Country Music praises for its “flawless harmonies and picking.” The reviewer goes on to say, “This is truegrass the way I like it, tapping into the music's inherent soulfulness rather than the drag-racing side of things.” Think of it as bluegrass comfort food – and enjoy! Tennessee singer and songwriter Martha Scanlan has a voice that can take you far, to distant times and places. That’s probably why she was featured on the soundtrack of the film Cold Mountain, singing with the Reeltime Travelers. The website Dirty Linen called her first solo album, The West Was Burning, “a revelation, an instant classic and one of those rare albums that defies genre and generation. She evokes Western landscapes as effectively as Georgia O’Keefe did on canvas.” Now she has a new album, Tongue River Stories, inspired by her time living and working on a century-old ranch in the southeast corner of Montana. 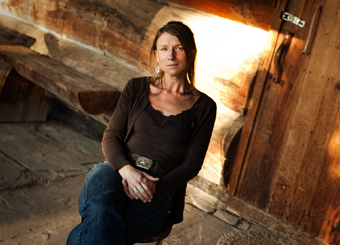 Martha first gained national recognition for her songwriting at the prestigious Chris Austin songwriting contest at Merlefest in 2004, where she won awards in two categories. Her song “Little Bird Of Heaven” was featured in the novel of the same name by Joyce Carol Oates. Joining Martha for tonight’s show will be guitarist Jon Neufeld from Portland, Oregon.